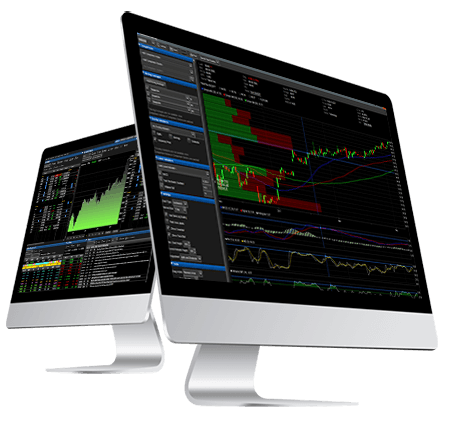 Quotestream is a sophisticated, user friendly and dependable market data and technical analysis solution. 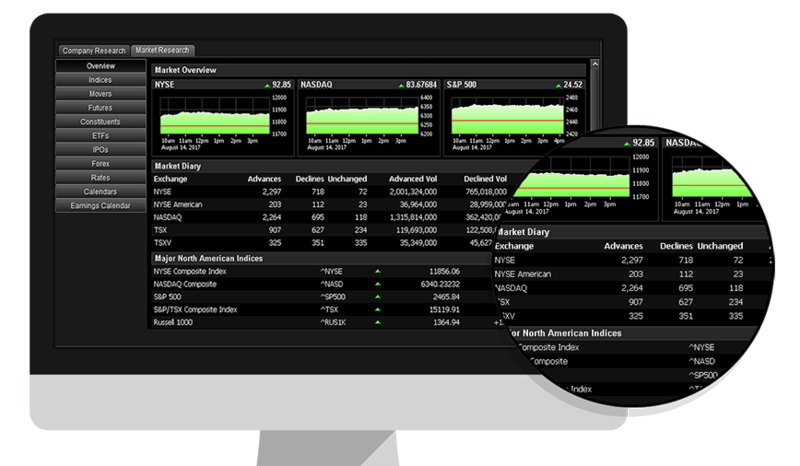 It features broad market coverage, reliability, complete flexibility, ultra low-latency tick-by-tick data, as well as completely customizable screens, advanced charting, comprehensive technical analysis, news and research data. Features comparative, historical, and intraday chart data as well as technical indicators, chart analytics as well as support to save your chart studies. 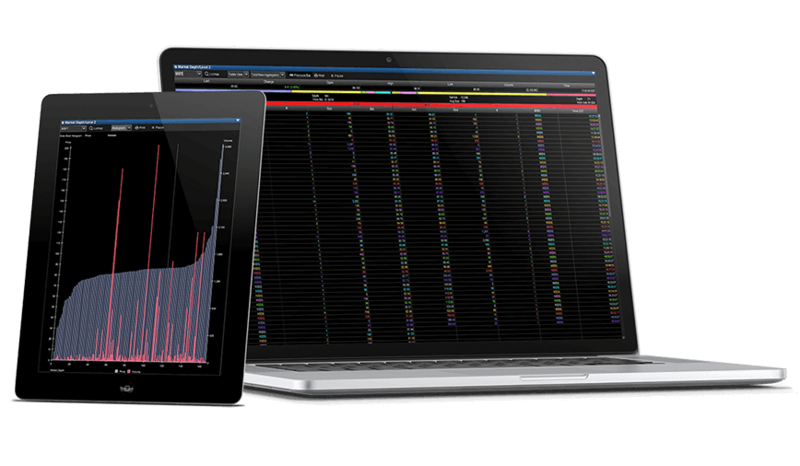 Tick-by-tick real-time charting tracking your stock’s intervals on the market is also available. 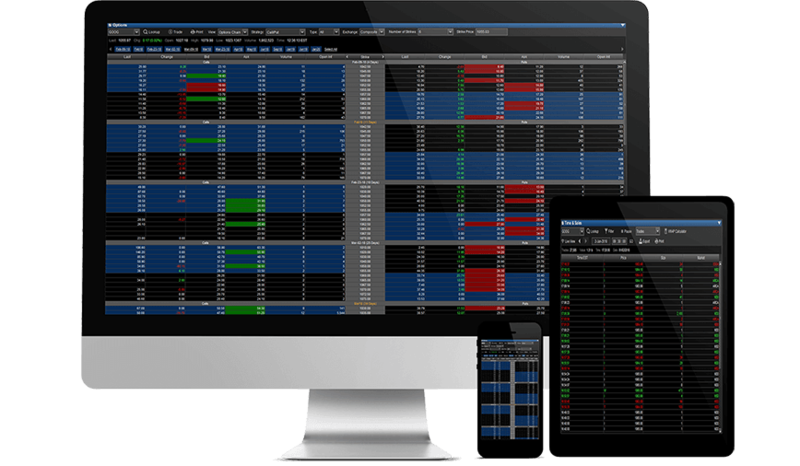 Provides tick-by-tick access to all trades and quotes in the current market session. You can also filter results by volume, trade size, broker, buy-side, sell-side etc. Up to 90 days of historical trade data on equities is also available. Features streaming orderbook data for up-to-date information on market activity and Bid/Ask offers and also includes a Level 2 Pressure Bar as a general indicator of the market trend. Market Depth for NASDAQ, OTCBB, OTC Markets, LSE, TSX, TSXV, CSE, Aequitas, and other Canadian markets is available. Quotestream features tick-by-tick lightning fast market data, research information, and extensive customization with unmatched depth of content, functionality and ease of use. Quotestream provides all the information you need to plan and execute the best investment strategies. Quotestream is quite simply the most cost effective solution of its kind. 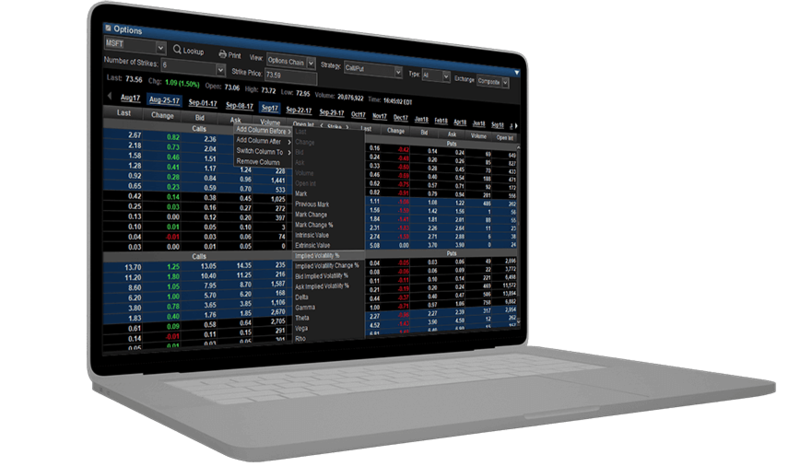 Quotestream offers world class access to market data, analytics, research information and more, all in a totally portable co-companion desktop and mobile system - and at the absolute lowest price. 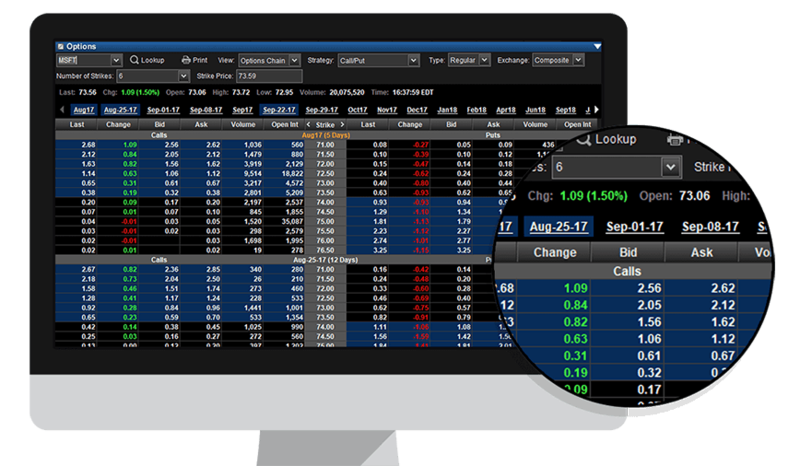 Complete access to Option Chains and detailed Option quotes, as well Implied Volatility, Most Actives, In/Out of the Money, At the Money, All, Composite/Regional, Calls/Puts, and Option Charts. Limit your risk and maximize return using Option Strategies. Strategies currently covered include Call/Put, Covered, Vertical, Straddle, Strangle, Butterfly, Iron Condor, Reverse Iron Condor. Featuring real-time greeks data for equity options including Delta, Gamma, Theta, Vega, Rho. Mark and Intrinsic/Extrinsic indicators as well. 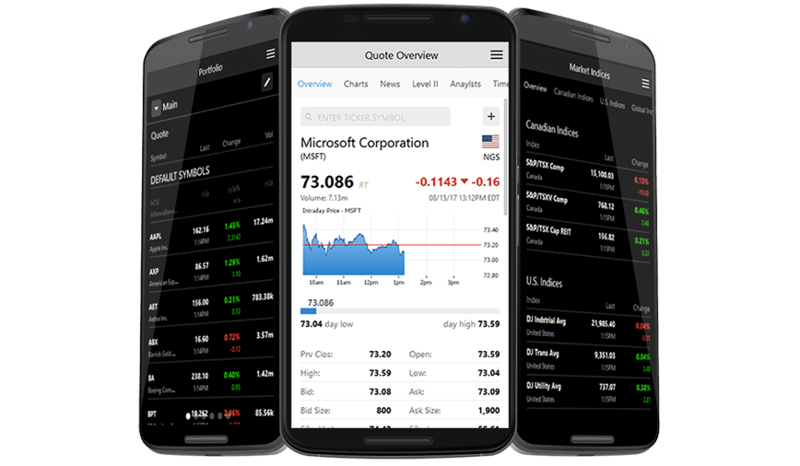 Quotestream Desktop and Mobile are synchronized to provide total portability, allowing access to portfolio management and market information from the office, at home, or on the road. Quotestream offers a user-friendly experience with easy to use customization interfaces giving you the ability to create the best workspaces and layouts for your day to day investment activities. Easy access to in depth company research information featuring detailed quotes, charts, fundamentals, news, history, market depth, time and sales, insiders, financials, company profile data, share statistics, earnings, analyst ratings, and events calendar. 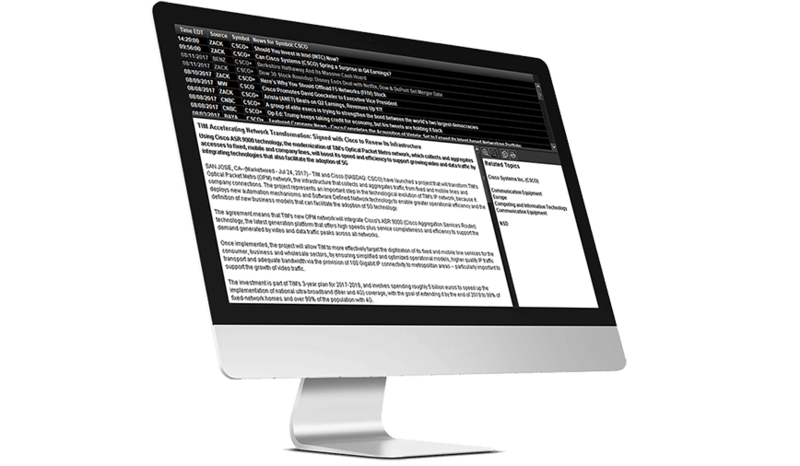 Featuring information from reliable real-time sources, Quotestream provides company-based, topic-based, sector-based news and market commentary from press wires and news services as well as comprehensive company filings and announcements. 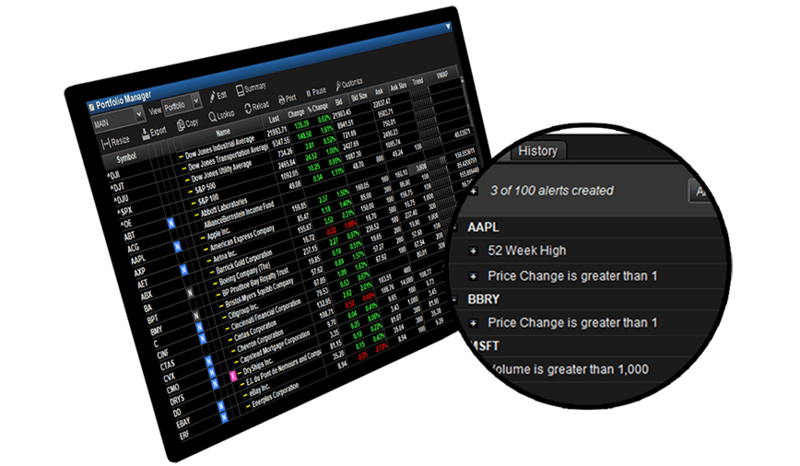 Access on-screen and email alerts when stocks reach a certain price, volume, bid, ask, price change, or when they hit their 52 week high or low. See your Portfolios and Watchlists get alerted when a new news story is released or when a dividend, split, or earnings event is announced. Featuring dollar gainers/losers, percent advancers/decliners and volume actives. 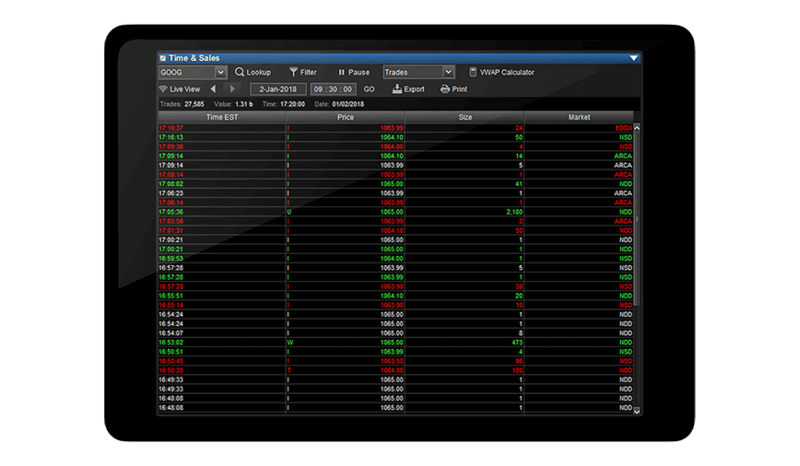 It also includes movers in Pre Market and After Hours and can be filtered to display results by Industry. 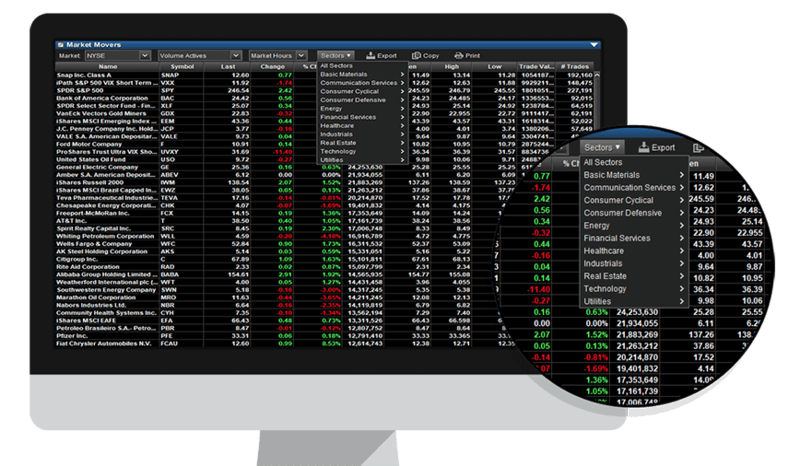 A powerful stock screener supporting comprehensive screening with hundreds of screening criteria available, including share performance, average share volume, exchange, dividend, income growth rates, margins, turnover, growth, ownership, market cap, and much more. Save your screens in order to refine your stock research arsenal. Comprehensive information covering Market Overviews (Market Stats), Indices, Market Movers, Futures, ETFs, IPOs, Forex, Rates and Market Calendars (Broker Ratings, Earnings Estimates, Corporate Actions). 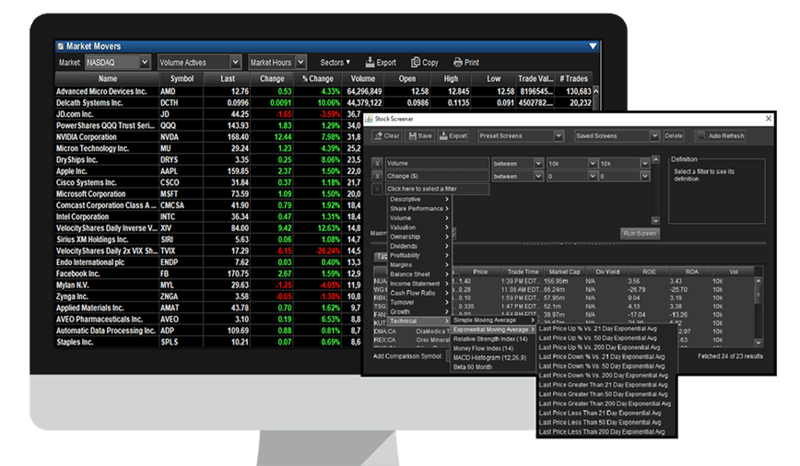 RTD (real time data) and DDE (dynamic data exchange) links extend market data access beyond Quotestream, allowing you to manage unlimited client portfolios and run your own calculations through spreadsheets. Any application that supports RTD and DDE can incorporate dynamically updating real-time intraday data. 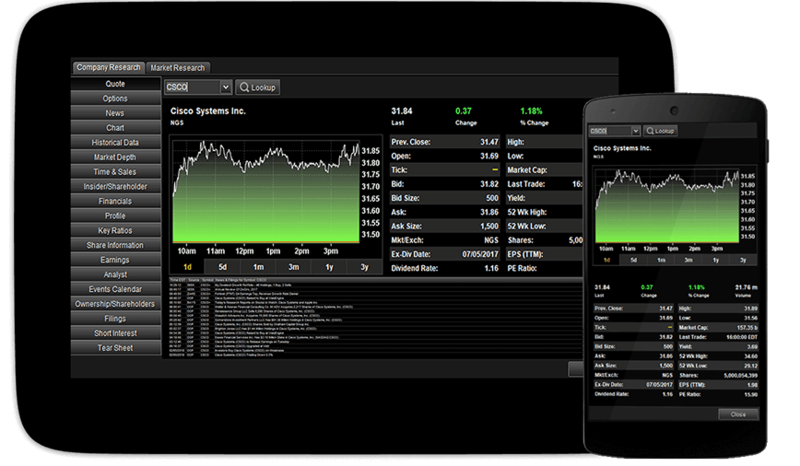 Features the same access to data and portfolio management on your mobile device. The Desktop and Mobile applications work in a co-companion relationship, where any changes made on one device immediately transfer to the other. Tick-by-tick low latency real-time level 1 and level 2 streaming data. Track up to 30 Portfolios of up to 300 symbols each (9000 symbols). Multiple configurable portfolios with custom layouts. Customize the look and feel by modifying color and font settings. Dynamically updating Market Indices, covering North America and the Global markets. Historical quote data - exportable and downloadable for custom manipulation. 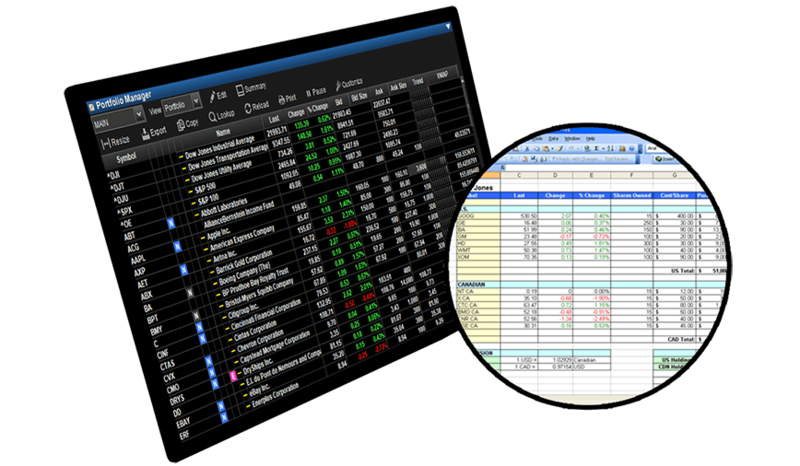 Events Calendar which features broker ratings, earnings pre-announcements, earnings surprises, earnings estimate revisions, stock splits and dividends. Scrolling stock ticker and quick snap quote bar that can be toggled on or off. Heat Maps providing a visual look into your portfolio watchlist, the markets, sectors, and index constituents. Waterfall Ticker Module streams Time and Sales for a whole portfolio. Ownership/Shareholders information on the holdings of firms and funds as well as Insiders transactions for a symbol for up to the last 2 years. Short Interest statistics in order to judge investor sentiment on particular stocks. 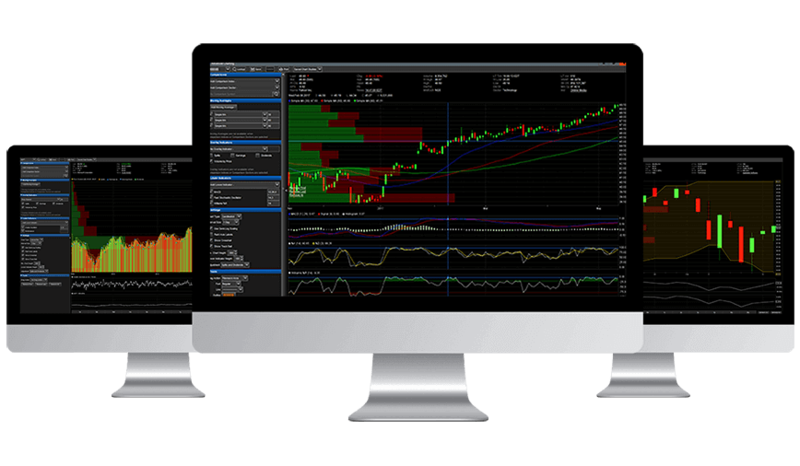 NYSE, AMEX, NASDAQ and NASDAQ TotalView (Level 2) with OpenView. OTC Bulletin Board and OTCBB Level 2. OTC Markets (Pink Sheets) Level 1 and Level 2. London Stock Exchange Level 1 and LSE Level 2. OPRA options exchanges, including regional coverage and Greeks: CBOE, Boston, American, ISE, Pacific, Philadelphia, MIAX, etc. Regional SIAC exchanges: Boston Stock Exchange, Cincinnati Stock Exchange, Pacific Stock Exchange, ISE (International Stock Exchange), and Philadelphia Stock Exchange. Financial Rates including US Treasuries, Lending Rates, LIBOR, etc. Comprehensive International indices including major Europeans and Asians.